RJ Balson & Son is Britain's oldest family business, founded over 502 years ago in 1515 during the reign of Henry VIII and has survived twenty-three monarchs, two World Wars and a revolution in supermarket shopping. The current proprietor Richard Balson is the 26th generation to serve in the business. 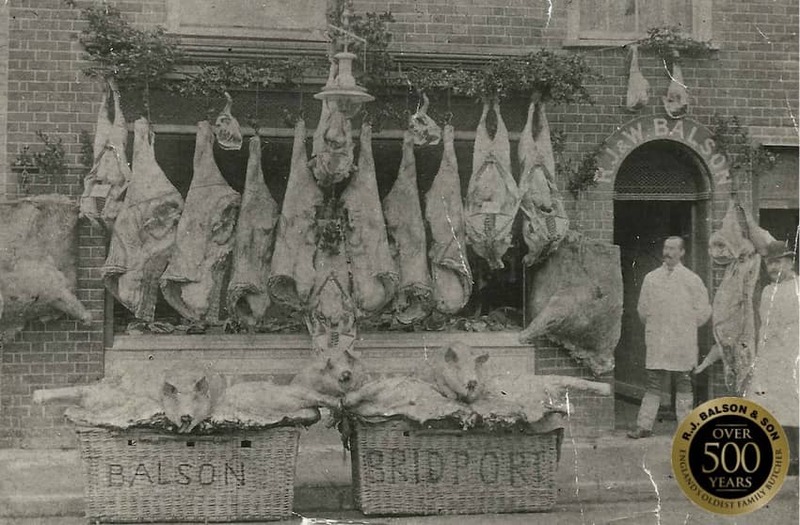 Robert Balson set up his first stall about a mile away from where the shop stands today in Bridport. The family has occupied the current premises since 1892. The traditions of selling good quality local free-range meat with personal service are combined with new product ideas in response to customer demand for the less fashionable cuts right through to the exotic. The sausages or faggots are made to traditional secret recipes handed down since Tudor times.